off with those heads was added to your shopping cart. 1. 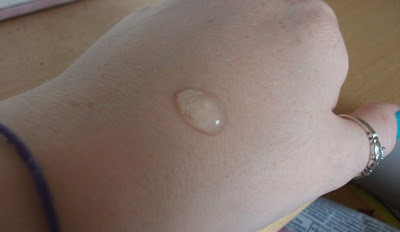 Pump 2-3 pea-sized drops onto your palm. 2. Apply on T-zone areas, or areas with black and whiteheads. Water, Aloe Barbadensis Leaf Extract, Hamamelis Virginiana (Witch Hazel) Extract, Carbomer, Propylene Glycol, Menthol, Melaleuca Alternifolia (Tea Tree) Leaf Oil, PEG-40 Hydrogenated Castor Oil, Sodium Hydroxide, Mentha Piperita (Peppermint) Oil, Methylparaben, Propylparaben, Diazolidiny Urea. This product is amazing! It helped a lot with my blackhead problem that lasted years. The pore is not completely gone but it looks way way better than before using it. I have been using this product for sometime, it is a good product to get rid of blackhead. Not 100 percent remove all the blackhead but it gives a big chance. Will always purchase this product. Like it! I started using this product after my month facial and applied it religiously every time after I cleaned my face. Been trying it for almost two weeks and I am impressed with its oil control at the T-zone and I notice my blackhead growth is significantly reduced. Love it! 10days of using it and my skin turned absolutely CLEARED!! my skin became awesome. My pores became smaller and my skin tone was more evened out. Black and white heads became lesser.Overall, very happy with the results. Most important, the price is affordable. Blackheads come out after using for a period. A bit irritated at the first, but it's okay after using for awhile. Quick remedy for blackheads! Does what it says – painless extraction. Minimal time spent. Great product! Quick results, thumbs up! WOW…it took less than a week to see results. I’m a happy girl. Persuaded my sister to get her own bottle coz I’m not sharing. Effectively removed my stubborn blackheads! I almost gave up and then I was introduced to this product. Really works with minimal effort. Will repurchase once finish! This blackhead sebum gel do soften the blackhead. When i use i do feel it will oily as the blackhead may be softens back to oily texture, but one thing i do not like is the oily feeling when blackhead is soften. As it feels sticky and dirty too. But it do clean the blackhead as i do use with Squeaky Clean cleanser to maximise the result. This product is highly recommended. It reduces my blackheads and I am really happy with it. Those who are struggling with blackheads, please purchase this product. Worth every penny! Off with those heads tighten my pores in just 3 days time, I did see the changes of my blackhead, blackhead lesser & finer pores! SUPPORT SUPPORT!! Definitely will reorder again, Im buying with promotion package, 45ml FOC sheer off crease, Hopefully there will be more interesting promotion!! CHEERS!! i started using this since a month ago. It is effective in tackling the blackheads but at the same time it leave my upper lips cracks and allergy. This product definitely reduces my blackheads especially on my nose. however, my blackheads did not fully disappeared within the 14 days but the amount has reduced very significantly! less blackheads can be seen unlike before. that is why im still using this product. it definitely helps in making my face less oily as i dont have shiny nose anymore. the texture is very soft and comfortable on my skin. surely im going to keep using this product. This is my ultimate holy grail product. I was recommended this product when I went to SASA a few years ago and recently repurchased this. I have extremely large pores = lots of blackheads so this product is a life saver. When I apply it, I get a tingly feeling but after cleansing, the blackheads disappear. Thank you for this product! Love this gel very much, it worked great. Reduced my blackhead & now my nose area is more smooth than before. Thank you. This product really gives a good result to my face. I have a very serious blackheads problem at T zone and need to go for facial every week to squeeze them out because they are stubborn blackheads. After 6 weeks using this product, my beautician finally give a good comment during my facial session which blackheads reduce and easily to remove. It also reduce oil production at T zone. I have oily combination skin and have always been bothered by blackheads since i was a teenager. Even though the miracle of having zero blackheads didn't happen after 14 days, I'm still using it after two months because my skin did become less oily, that is for sure. I also didn't mind the slight tingling sensation as it felt like the gel was penetrating all the oily clogged pores! Even though I'm quite generous with the amount i apply, there still seems to be almost 90% full bottle despite twice daily application! I would definitely repurchase this product，because if i no using it my face would be have many pore. after using this product blackhead easily remove. can't say this is a perfect product as I still have blackheads on my face after using it for many 14 days (nearly 6 months actually). still, I need to clear the heads by hands after cleansing my face every night. the best thing of this product is that you can see your pore and redness reduced in 10-15 mins after applying this gel on your face. Just received this yesterday and it was with a box of free gift! I was so so surprised!! Thanks B.liv. Btw, this product is really works for me, love it very muchhh! After applied this, my blackheads and whiteheads didn't remove, i still want to clean myself, but is easy to clean now. Still will continue buy this products. I purchased the 30ml version of this product in mid July 2015, and I have been using this serum for nearly three months. Since my blackheads are only in my nose and inner cheek area, I only apply the serum there. So far I've used up half of the bottle, and I must say that it's pretty amazing! Not only has it noticeably reduced the size and darkness of my blackheads but it has also kept them away. I can still see the tiny little dark heads up close, so I hope that by continuing to use this product will keep the reducing going. At first I thought that I could get away with just using it once a day at night to see it's effects, but of course using it twice was twice as more effective. The price is a little steep for me, but I would definitely repurchase this product. i used to have a lot of breakouts, pimples and blackheads all over my face during my studies in Uni. After i used this serum for a term, my pimples are gone and blackheads are lesser. This is best product to get rid any white & black head. Have been used for almost a year and helped me cope with my oily face. I have a serious blackheads problem. Whenever i applied foundation, it looks even more obvious like popping out on my nose look exactly like a strawberry nose. My black head reduces after 1 week!!! how amazing it is~! however, it is on the pricier side. Anyway, i will still repurchase this since it works wonder! I have been using this product for about one month now, mainly at area on and around my nose.I was really happy to see significant improvement in my blackheads problem for the first 2 weeks. But for some reason, it stopped working after that and my nose still have blackheads now. I don't know if continuous usage of this product for another few months could really help me achieve the blackheads-free skin, but I really hope that it will. I have nothing much to said about this product since it results had ald proven by many and now including me. My blackhead start to get less only after I apply it for one month, however it does the job as promise for clearing my blackhead. I will definitely repurchase and maybe try out other products as well since bliv has make me believe their product is effective. Using my 3rd bottle now. It reduces whitehead and blackhead! The best whitehead product that works well on my face! Highly recommend to my friends and everyone. The best product I ever had to get rid of white and black heads. When I used pore pack on my nose, the white heads is totally gone! Highly recommended if you want to have clean nose and face from white and black heads! I love bliv! Was sceptical about the results, but after using this for about 2 weeks, my face was less oily, and my blackheads really reduced a lot! My complexion also grew better. :) love this! I like this produce! after use this produce, my whiteheads blackheads has reduce and let me feel good! I must will introduce to my all friend! Justt one use and i can see results, it blow my mind off. I have oily face and this really helps reallly alot. after using it for a week my blackheads are reduced and no more new pimples poping out. For once my face is clear and free of pimples. i use it together with the cleaner and pore tightening. Love it so much! Don't ever stop making this. Did not have high hopes on it but it really works! I saw differences after 2 weeks of usage and became addicted after a month. It doesn't "remove" blackheads, but makes it a lot easier to clean up the pores. Highly recommend. going into my fourth bottle now, good product that you'll want to keep using. whilst it doesn't get rid of blackheads completely, it reduces them and improves the skin texture and appearance. skin looks less bumpy and less dull. effective at controlling oil at the t-zone. this is one of those products that if you stop using it the differences will become apparent. finished a 30ml bottle in 8 months and purchase the "Double Deals". i cant go without using it every night. really keeps away the black and white heads. i even bring it with me during my tavels even though it is a bulky bottle! I have always wanted to find a product that will cleans off my blackhead entirely, I have tried tear off mask before, but my blackheads and whiteheads are still growing. Until I met this product, it solved all my problems. I've been using it for months already, it is very effective. At first I blame it as I see blackhead on my nose again when I've stop using it for a week, I quickly apply and can see the result just in a day. It is definitely 100% effective but with a condition that we shouldn't lazy or forgotten to apply it, continuously used will have an excellent result. Thank you B.liv. Have been using this product since February and I will say that it works well on me. I used to have really bad clogged up pores but now it has gotten so much better. I am really happy with the results as I no longer have to worry about the appearance of my blackheads. I would definitely recommend this product to friends and family. Thumbs up for this product! Very useful. I usually apply this in every two weeks or so, when blackheads and those little grease granular on face start to appear again. Just one night skin feels refreshed and deeply cleansed. I have used this bottle to reduce my blackheads. although i did not see the effect of blackheads get off by itself very obvious but it does help to soften the blackheads and make me easier to squeeze them out. overall i think is good product and worthy. i have repeated order and trying the shrink and tighten next. i have using this few years already,this really make my nose smooth than before.This is my six purchase of this product.Now i started using the shrink and tight,finally decide to write a review. I've been using this product for a couple months. It's actually a good product because it won't dry out my skin and most important is the OFF WITH THOSE HEADS BLACKHEADS SEBUM GEL making my T-zone and some other parts of my face is controllable to the pimples, blackheads and whiteheads. Thank you b.liv. Skin type: dry, sensitive, ance-prone, clogged pores I do not have a lot of black heads because my T-zone is actually dryer than my U-zone, but instead I have a lot of clogged pores and whiteheads. My skin is super sensitive it cannot even use a lot of the product that is for sensitive skin without out breaks, rash or clogging my skin further. But this baby did a wonderful job. I not only helps taking out the impurities one step at a time, but also helps the absorption of the skincare products afterwards. I have been buying this products for over a year now, so i know this product is not for prolong use, because once your skin will get too accustom to the help it will get worse once you are not using it. So if you have blackheads, use it on the place where you need it, when the blackheads are gone or have use consecutively for over 28 days than stop for a week or even leave it until next time you have the urgency. But if you my problem which is skin that is prone to clog pores, you do not want to use needle and tools too often to clear out the clogs, then you need constant use of this product to help eliminate the build up of deadcells and sebum inside your pores. However, as this will be a everlasting battle, it is good to stop every now and then. Like every 1cycle (14 days) and stop for 2-3 days or every 2cycles (28days) then 4-5 days. The days where you stop may feel like hell, for me, I have flakey, irritated skin and sometimes breakouts during those times. The stopping period will keep the optimum efficiency for the next cycle. Although it is awful as it sounds, it beats having to use needle and tools to squish each of your pores, and leaves semi-permanent damage to your skin cells like scars and large pores. To conclude, this product is fantastic, as it will gently exfoliate your skin daily to help prevents excessive dead skin cells and well balance the sebum level of your skin. And the chemical exfoliant they use is natural and safe, so unlike AHA or BHA, it would not have any burning sensation or causing further breakouts, better it will soothe your skin when you have break outs. In general it should work better for oil to combination skin better, because for me it is still a little dry but could be dealt with by using mild, non-foaming cleansers and better moisturiser. As long as you believe in this product, your wish will come true. Been using it for a few years. It's one of my go-to products eventhough it doesn't really remove blackheads as claimed. I noticed that it made the extraction of blackheads much easier. I tried not using it for a while and the blackheads were just stuck in its comfy home. Super hard to extract. Some might find it pricey but do know that the product can last me up to a year or more because I only use it on my nose (a small dollop will do). I have tried every product under the sun to reduce blackheads and whiteheads, from prescribed products, hormones, expensive "promise-you-everything" lotions and no product has ever diminished in at least 90% the amount of blackheads, This is my third purchase of this product and I highly recommend it. With discipline, good hygiene and off with those heads your skin will look clean and healthy! I promise! I've use it for few months, yet still left with 3/4 bottle. I apply it on nose and cheek since i have serious blackhead problem and also some pimples. 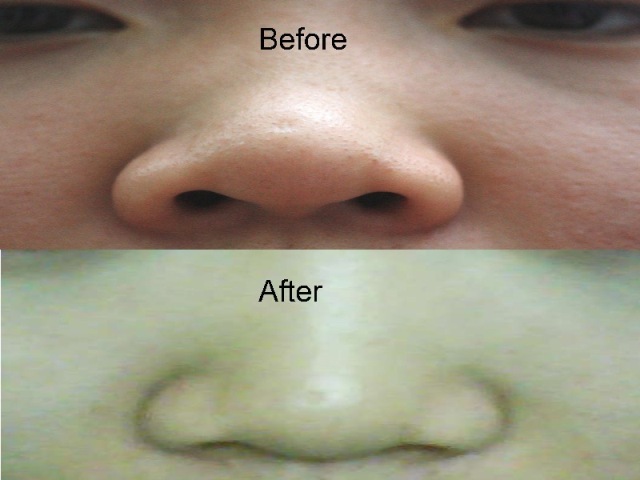 It is really worthwhile as after two weeks the is no more blackhead. I received 3 small 5ml bottles as samples for trial at a roadshow. Amazingly, on my first bottle, within the first week I could feel the difference in texture of my skin around the nose and chin area. The black heads and whiteheads are gone and my skin is incredibly smooth! No need for painful squeezing during my facial sessions, and I could finally enjoy the massage instead of squeezing out blackheads. I've tried a lot of similar products before and this is the best blackhead removal product ever ! LOVE LOVE LOVE...i have been using this product about 5 years,just can't live without it! I have oily combination skin. I was trying to get rid of blackhead and clear my pores by squeezed the blackhead out using blackhead extractor all these years. However, this is not working but caused inflammation and pimples formation, make my face full of acne scar. Recently, I get know of off with those heads from a friend, and then i get myself of a Fantastic 5 set from Sasa. It is quite expensive for me, but I am confident with bliv product since they are having 14 days money back guarantee, so i decided to give it a try. I have been using off with those heads for one month now, it is really works on reducing blackheads and whiteheads on my face. Most noticeable effect is on my chin, my chin become much more smoother now. Another thing i found is that it can control and prevent pimples. What a surprise! This is a really good product, i have recommended it to my sister and friends who suffer from blackhead problem. This is the second time I bought this product, effective for whiteheads! My skin is very oily with a lot of blackheads at my T Zone. I've tried pore strip, blackhead gel remover, mud mask and many more but it does not help much. I had 2 big stubborn bumpy blackhead near my nose. I tried extracting it using blackhead extractor but end up injuring my skin. So i went to two facial shops and ask the professional to extract it. To my surprise they told me it cant be extracted yet! I almost lost hope until i met b.Liv off with those heads. I applied it for 2 days and tried to extract it and it came out SUPER EASILY! The smell and texture of the gel is so nice no oily feel. Im definitely buying this product again and recommending it to friends! big love to this product. my complexion is clear and no more annoying white and black head. my pores look smaller too. !! I used this product and feel a great improvement on my blackheads as blackheads had been a pest in my life. I will continue to use it and highly recommend to those people who have blackheads problem. =D Happy customer! Quite effective to reduce whiteheads, but I dont see any effect for blackheads. Overall still ok, will repurchase ! I have been using this product for almost 2 years and I'm still using it. It really improved my skin condition as it cleared not only blackheads but whiteheads as well. A big bottle could last me up to almost a year. Only small amount is required and it work wonders. Definitely my favorite one . Before being a "bliv-er", I lived in a cold country for 5 years, and as soon as I moved back to my hot humid country, my face went out of control. I had major clogging issues, I had whiteheads all over my face including my usually smooth cheeks, and I broke out with a new zit twice a week. I spent thousands on skincare (including premium brands) to improve my skin but nothing helped. It came to a point where I just went into a beauty shop and went "help me please" to the sales assistant. She introduced this serum to me and I went home with the 30ml bottle. Within a week, my face started to clear up like magic. In 14 days, I bought the 45ml bottle as there was a promotion. This was beginning of 2013; until now, I am still using this serum religiously twice a day because it has helped keep my oily face at bay, reduces appearance of new white heads (I don't have black head problems in general) and it keeps my face smooth. This is my holy grail, and thanks to this, I have also gained confidence in using the bliv range and am a strong "bliv-er" till today. I bought this product one year ago and it was amazing! The quality is very light and good for oily skin. I feel fresh and cool after applying it on my face. And I can feel my blackheads became less and easier to wash out. It also smells good. I will definitely use it again! i've been struggling with large pores and oily skin since i was a teenager. looking at my blackheads on my nose can be quite frustrating esp after putting on makeup, as it emphasizes on the blackhead bumps. I’ve tried BHA and AHA and they both gave me little skin coloured bumps which made things even more frustrating. I’ve read many reviews about this product but due to it’s price, I was put off into trying this. I chance upon a sale in which when you buy this, you’ll get a free got oil relief toner so I purchased it. It took 2-3 weeks for me to see awesome results. Not only, There were no more uneven blackhead bumps after putting on makeup, blackheads were reduced and they were easily removed using a blackhead extractor. It’s almost 2 months through this product now and I only use it every night, just a light press enough for my nose and forehead, I’ve only use 1/10 of the bottle! Will def purchase this again when a good deal comes! I have been using this product for more than two years. It obviously get rid of my black and whiteheads, also keep my acne under control. The blackheads are gone without squeezing. I was so amazed and continued to use it. The pores on my nose are more refined and I have lesser heads. With off those heads,it dissolves those stubborn hard heads into mush. And it helps to shrink those pores too. I'm so glad I found off those heads! I will continue using this. Love it! Last five years, I received a small tester when I purchased Cleo magazine. I used it and I am totally satisfied with the effect, even only a small amount. I was a student then and could not afford to buy the full bottle. But until now I can still remember how it magically removed all my blackheads, and a month ago I rewarded myself with a large bottle the product. I am happy as it is totally good, and I think a bottle of 30ml can lasts up to 4-5 months for me. I used this product for 5 days and feel a great improvement on my blackheads. It is very sufficient. I will continue to use it. Hope more customer can enjoy it. i have blackheads and whiteheads on the T zone area. before i used this product, i also have 3 melia on my face. after using it about a week, all my blackheads and whiteheads disappeared and after 2 weeks my melia vanished. im so happy. My T-zone has been an oil deposit for as long as I can remember. I have tried so many products from nose strip to cleaning mask to face wash to other black head remover and NOTHING cleaned my face and keeps it clean like Off With Those Heads! I used to need to squeeze my T-zone every other week on top of all the cleaning products I was using and it could only remain clean for one or two days. Off with those heads really changed my life!! In less than 2 weeks of usage, I noticed every part of my T-zone is clean as it have never been! It not only cleans my pores but also keeps it clean. My face has never feel so clean before! Now with almost one bottle gone, I’m still happy with the result. I now only occasionally need to squeeze my nose, but the rest of my T-zone and cheek remain heads free! The only complain I have is that once a while it will dry up my nose, then I would stop applying for several days to allow the dryness to go away. Overall this is really the only product that works on me after many years of searching. Will keep buying it! I have been using this product for over a year. While it doesn't cause the blackheads to disappear entirely, it definitely reduces their prominence on my face and keeps them at bay. I have had the best results using this product in combination with good basic skin care - washing my face daily and using this product on my T zone daily, exfoliating once a week with gloves, and using occasional pore strips when the blackheads start to bother me (about once every 2 - 3 months). I have been using this product for a week plus and the result is amazing! I have a very dry and dull skin with lots of bumps around my jaw line and forehead. After a week of usage my bumps are reducing and it doesn't dry my skin. My skin looks brighter and healthier now. I can't wait to see the result after a longer period of usage. Thank you b.liv! Certainly worth every single cent! 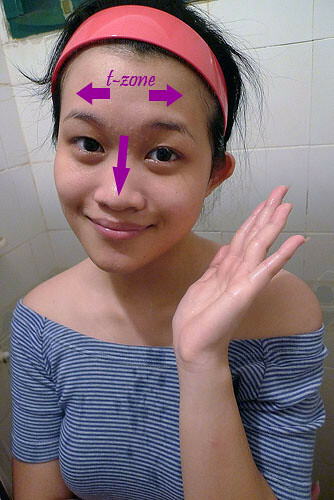 I'm having combination skin where I have oily skin at T-zone and dry cheeks, with blackheads and whiteheads on my nose. Had been trying many products before to remove blackheads but didn't work at all until I started to use this product 1 week ago. In just 1 week time I can see my blackheads around my nose have been reduced significantly, without any pain! I'm so amazed by this product and definitely gonna continue to use it. I've been using this product for almost a year now! It is unbelievable! This product goes wonders! My whole face has whiteheads, and it goes instantly! this product will never go wrong. I am now tiring the complete set of blackheads and whitehead. Need to get them off my cheeks! Since young, my T zone area was full of blackheads and the only solution was facial which was a painful process. After using this product, I could instantly see the results within 2 weeks. Now I use it everyday to maintain and keep the blackheads away. I am using the 45ml bottle since Jan 2014 and right now there is about 25% remaining. So it is pretty long lasting. The texture of this product is gelish with a light smell. The only downfall of this product is it leave you with fairly large pores so you would need a good pore minimize to use together as combo. Anyhow I would definitely recommend this to a friend!!! 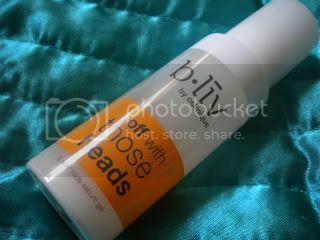 This is the best and the very first product of bliv I ever used. I usually need to squeeze out my blackhead. It hurts me quite a lot... and will cause breakouts which I hate so so so much. But after using this product, my blackheads will vanish by itself! I never bothered by them anymore. I can look my nose as close as I want and merely see any blackheads! I will continue use it for the rest of my life! I have been using this product for over 3 years now and I am amazed by it. My skin has improved so much. I no longer prone to pimples, blackheads and whiteheads! My skin feels so soft and smooth! I have received compliments from friends that my complexion is so much better compared to before. I would definitely share this product to friends and family. This is a much-have in my skincare routine!! I have very stubborn blackheads on my nose and I have tried so many products trying to get ride of them (AHA, BHA, exfoliate, nose strips...u name it), but noe of them worked. I decided to purchase this product after reading all the rave reviews. So now that I have almost finished my first 30ml bottle, I have to say I am IMPRESSED. The blackheads on my nose are almost gone and my pores are significantly minimized! My nose has never looked this good in like 15 years!!! I also put it on my face wherever I have little bumps or pimples and it works very well. I will buy this over and over again!!! I have serious blackhead on my nose. 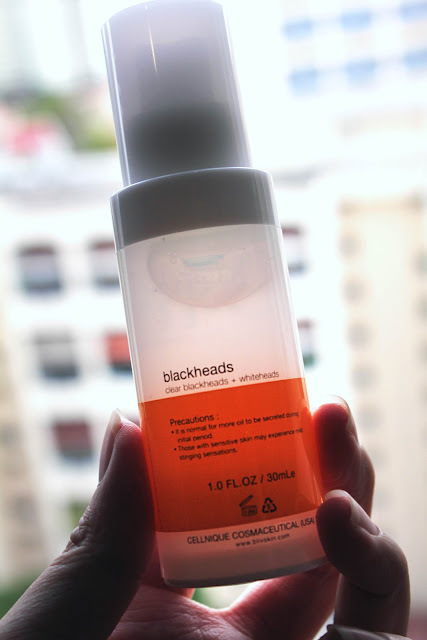 After using up a 15ml bottle f this product, I could say 95% of my blackheads were gone! However, it doesn't work for my whiteheads. My chin is still rough. Now I am return to buy a larger bottle. Let see if my whitehead condition will improve after I use this product for longer time. Will update. I bought this product based on the recommendations from the sales lady. I didn't really notice a difference initially, until I ran out of the product. It was only after I stopped using it that I notice what a difference this product made, and how clean my pores were! This product made my pores soft so when I steamed my face or straight after a shower I was able to push my blackheads out very easily. I would recommend this product! This is an excellent skincare product. The blackheads have reduced a lot and become easier to clean after applying the serum for a couple of weeks. My friends said my skin looked finer. Highly recommended. This is one of the most face and life-changing product I've ever tried. I will definitely be keeping this product in my skincare routine for life! It is a clear gel that you can put on your T-zone or just anywhere that you need treatment for white/blackheads. For me, it is on and around my nose! I've struggled with getting those pesky white/blackheads out for a long time and I've been to places to get facials and whatnot, but nothing has made my nose as clear as this product. I applied it to my nose area faithfully twice everyday - a little goes a long way! After just 2 weeks of using the product, my nose was definitely lighter and brighter in colour because almost all of those nasty looking blackheads were gone! I was so happy! As well, this product did not dry out my skin! I will keep using this product to keep those white/blackheads away! I recommend this product strongly, that is very effective, after using it, my skin become smooth and get rid of blackheads, I love it. I must repurchase it. This is the most amazing product I have ever used to get rid of my blackheads! I have had blackheads on my nose for years, and this serum helped a lot within a month. My skin is a bit sensitive, but this serum is perfectly ok for my skin, even though it hurts a bit if I use it after cleansing mask. So I recommend that do not use it after cleansing masks. This serum also helps to oil controlling, and as a result, this helps with the long-time wearing makeup. I've been using this daily for over a month now. I find this product is good not excellent. I purchased it because I read many good online reviews about it, so I decided to try it. However, it's not a miracle product that I thought it is. I thought it can get rid of all of my black heads like many of the reviews described, but it doesn't. Also, I found this product works better on getting rid of blackheads than whiteheads and pimples. Overall, this is a good product. I have less blackheads and whiteheads, but they are not completely gone. This is my skincare essential for whenever I travel to humid climates. I get hideous clogged pores and nothing gets rid of them except 'off with those heads', and I've tried everything else! So easy to use and gentle on my sensitive skin, I'd never use anything else. The best product ever that suits my problematic oily skin. I was a bit of skeptical when I first came across to this brand what's more this 'say-goodbye-to-squeezing-gel' but it didn't fail to give me a WOW effect! It does a great job on my face as they REALLY MASSIVELY help to reduce the acnes and blackheads on my face! I am not saying I have an acne-free skin condition now but at least it's all under control with this magical gel!!!!! This is no doubt my favourite gel of all time and would never want to discontinue from using it!! BIG THUMPS UP! When I used this as part of a sample pack I found it worked really. It feels cooling and it helps dry out the heads of the pimples, taking away their strength. It works perfectly within it's designed range, inbetween the cleanser and moisturiser. Off With Their Heads has a cool name and is a cool product because it works for my skin - controlling the oil, making my skin much more balanced. I just received this as a sample when I bought the shrink and tighten+ product. This is amazing and I would like to buy it when the sample is empty. This is my second purchase! My pores were soooo clean halfway into my first bottle of "off with those heads"! My sister took the rest of the bottle because she saw how good it worked! I also love the pump coz a light press gives me the right amount of serum! The design also lets me get down to the very last drop of serum -- no wastage! It`s really great and helpful. My blackheads have been removed and I highly recommend it if you want to get rid of those annoying things. I`ll definitely reorder it again. very very useful product. the first one that really help me to get rid of my blackheads. I am going to purchase again definitely and actually my husband is using this as well!!! I used to have a lot of blackhead, especially around my nose. Only after 3 days using this product, my blackhead almost disappeared. My T-zones also less oily than before. This product controlled oil very good on my face. I received a small bottle, is a gift from a friend. Just started, no feeling, thought it would previously used as blackhead products useful purpose. But two or three days, woke up that nose out of oil than before; washing the face, the nose looks a lot cleaner than before, blackheads also reduced. Continue to use it, I hope two weeks after the results even more. I love b.liv. i only use at night on T-zone and chin. I came across this product from a you tube video and I can't believe how many positive reviews there are out there so I decided to give it a try. Out of my expectation, only after using it for one day and I can feel that my "strawberry nose" is gone. And I noticed that the white heads on my chin area have reduced as well. Very good product! Have to say that my stubborn blackheads have finally met their match. After 24 years, I have finally found a solution that actually works. Feels great on my skin and the slight burning sensation after applying is especially encouraging because it actually feels like something is working. Took about 3 weeks of daily application but results definitely showed soon after! Highly recommended product! Now I just need the shrink and tighten solution to finish the job. After years of using acne products, I am excited to find one that truly works! "Off With Those Heads" treats my blackheads and whiteheads and significantly reduces the appearance of my pores. It is an expensive product, but worth it. Please note that it definitely took two full weeks to see a difference. Also, I apply the product to my t-zone and chin with one full pump twice a day (two total pumps per day.) In doing this, the bottle only lasts 8 weeks, which is a short time for such an expensive product. However, I believe with my next order that I only need to apply once a day to still achieve the same great results. My aunt bought this product for me because her friend recommended it for blackheads. The results are amazing and if you had a lot of blackheads to start with, like me, you can see obvious reduction after 3 days. I use it on my nose and chin area where my blackheads concentrate mostly on... The gel isn't oily and gives a cool, refreshed feeling when applied. 30ml lasted me 5-6 months. Almost used up, I'm planning on buying more online. This product is amazing!!! I've been us using it religiously for about 3 weeks and already noticed my white/ black heads are reduced by 80%!!! I felt the cool & tingling sensation and that's normal as my skin got use to this product now! Great product!!! My skin is combination to oily and sensitive. I have used off with those heads for 2 weeks. there is a improve I can see. I like the texture, very light and a little cool. it takes time to absorb before putting the lotion on, but it worth. It make my pores getting smaller. it is the first product of large pores that really helps. I heard about it from my friend and bought it with pore serum together. I have used it for only a few days. The black head comes out and I can easily remove them. It is the most useful skincare product for the blackhead I've used. I really love this products, it saved me! I never had really a problem of blackhead and whitehead before the birth of my daughter. Yes, I had a few of them from time to time as everyone does, but it was never as bad as a couple of months ago when I stood in front of my mirror after 6 months staying at home with my new born baby. I can not believe what I see. I went to the doctors, many of them, they said "Oh, many things change for a women after giving birth". I tried many products, but none of them really helped. Until one day, one of my girl friends recommended me "off with those heads", only a week, I saw the black heads disappeared, it is really amazing!!!! It does not smell bad, does not hurt my sensitive skin and it works. I will recommend it to any of my friends who has such problems! Do not hesitate any more, just try it!!! It works!!! consistently apply for 2 weeks will cause most of the blackheads to disappear. i like this product the most! :) its just abit pricey. :\",Mary"
Off with those heads is amazing. it has eliminated most of my blackheads. I still have a few around my nose but I have no doubt they will get better over time. The blackheads I did had were very easy to remove and they didn't come back. Absolutely love it and will be continuing to us it. Now to try out some of the other products. My skin type is extremely oily. The blackheads on my nose really pissed me a lot. I tried a lot of products. None of them works effectively and efficiently like this product. I also tried the needle pick way, which is really painful. But Off with those heads really works on my stubborn blackhead without any pain. I have only used it for a week, but i have already seen the improvement. The blackheads are dissolved, which make my nose look cleaner. It helps control my breakout on my nose as well. It is very convenient to use. i also like the smell of it. So I definitely will continue using this product and I have already recommended my friends with blackhead issues to buy it. Just Love it! I love this product! I always forget to use this daily, but it does work. My blackheads are gone and recommend to use this with shrink and tighten which will be the next product I am going to buy. Below are the products I mentioned. I provided a suggestion link to where you can purchase the products. Please feel free to search on your own. Note, I bought all of my products instore. I've always had ALOT of blackheads but never believed in products that would prove to make pores smaller/eliminate blackheads. I heard about this product through Bubzbeauty and gave it a try. I have been using this product for the past 3 weeks everyday, twice a day. The first two weeks, I've noticed that clearing my blackheads was alot easier than normal. With a little pressure, my blackheads would immediately pop. This is the third week I have been using this product and the size of my blackheads really did get a little bit smaller! If you are patient and have huge blackheads like me, I couldn't think of a better product to get. This product lasts for a LONG time too, I use about 3-4 pumps each time and the bottle is still full. Just be patient with this product, and you will see a difference. This serum is pretty similar to the cellnique skin sebum action serum. I had purchased this because I saw a review done on it through bubzbeauty. I went ahead and bought the 45ml because I figured that it would be cheaper to buy the bigger one for more product. The serum has a minty smell and when you put it on your face, it has a slight tingling sensation like the skin action sebum serum. The only thing I didn't like about this is that I still have blackheads on my forehead however, the whiteheads around my chin area are completely gone! Which is amazing because my friends have been complementing on how my skin tone has improved so much. I would definitely buy this serum again to keep my pores clear and to keep acne and breakouts from reappearing but I wouldn't put too my hope in seeing blackheads completely disappear. I've been using this product for more than 6 months and honestly, I think its a really effective product for eliminating blackheads and whiteheads. I suffer from really serious case of blackheads and I have tried almost everything but nothing works as good as this. I would say this product has helped me gotten rid 70% of my blackheads - not 100% but this is good enough for me! Continuous usage is highly recommend!! This products is introduced by a closed friend. It is a great product. It does not give you the effect immediately, however after 1-2 weeks, the effect was shown. My face is brighter, less oily and the most important is that less whitehead and blackhead that are 'floating' on my face, especially when i applying the foundation. It gives a tingling sensation initially, but sooner after it settled. It absorbs quickly into the skin as well. Except the first two days when I first used the product, my face become very oily [so i would suggest someone to start it on weekend, so that you no need to have an oily face in the office.] Another con is, the price of the product, but according to my friend, this product is lasting. Well let see but this is an excellent product for someone has an combination skin with blackhead and whitehead issue. I am very happy with this product. It does make stubbron black heads under control. Been using it for 3 weeks, just a light squeeze my black will come out effortlessly (before I will bruise my skin because of squeezing to hard on those stubborn black heads! ), now I can see them reducing :) off with those HEADS! I purchased this because bubzbeauty recommended to her fans. So, I purchased it and i've been using it for 18 days. I works great. I've never used any product that is so effective like this. All my black heads are on or around my nose. Now 80% of those black heads are gone. Except about 20% remaining around my nose for 18 days. Now I am back to try the pore minimizer. I hope it will work as magical as this off those heads. The first time using "off with those heads", it gave me a burning, tingling, clean feeling. After a week of using this product, the burning feeling went away, and the most of the white heads were gone. It also leaves a smooth skin. I've already recommeded this product to most of my friends! i really like the smell, it absorbs really quickly into my skin, and most importantly, it actually works!! you need to be patient though, apply it consistently for about two weeks and you'll notice results! Love this product. Only been using it for about a month now and I can already see the benefits. Blackheads are greatly reduced. The good thing about this product is that you don't need to put a lot on so it will last a long time. Definitely will repurchase! This is the best product I've ever used, and I've used quite many exfoliants and scrubs, both high end and low end, from Chanel, Dior, Shiseido, etc. to Neutrogena. I have light black & white heads, and I was quite skeptical about this product at first. I can usually rub my white heads off with a towel, but my pores end up looking huge so I've been at a loss about what to do. When I applied the gel, I could immediately feel little white stuff balling on my nose, and I was confused at first. I thought it was the product itself, but they were my whiteheads! I'm super amazed, and I think with use my blackheads and white heads will be gone. Now, I wish I purchased the larger version. The price is a little steep but compared to the more high end stuff, it's very reasonable. 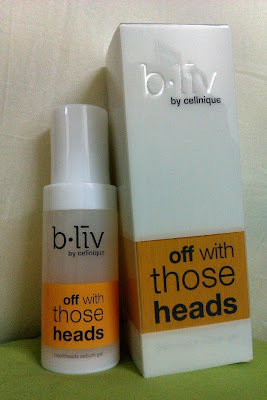 My sister recommended this product to me and this is my 5th bottles of bliv off with those heads. I can see the result after 2weeks, just like what they claimed in the packaging. It helps to eliminate about 70% of my blackheads, the remaining 30% can be squeeze out easily too. Price is reasonable, will continue to support this product. Loved the product. It feels great on the skin, not oily and not sticky at all. After using this, the lady that does my facial said I barely have any more blackheads. Currently using my 2nd bottle and will continue to repurchase. This review was made by echoli on youtube. This is a review by youtuber aiaiNkiki. ...Before I started using this blackhead sebum gel, my nose and chin area were the blackheads and whiteheads' breeding grounds..but after using Off With Those Heads twice a day, and just 1 pea size drop of product on each area, my blackheads and whiteheads really seem to have reduced by a lot. Certainly not my imagination with pictures as proof. .. I have used this only for a week and my blackheads are noticably gone by at least 50 per cent! this is the only anti blackheads product that works for me so far~ very satisfied! I found this product really lived up to it's claim, my blackheads and white heads actually came out after I used this product. Although it's quite dry for then skin, especially for Australia climate. However, I'll still use it. Very satisfied with it! I love this stuff it's truly amazing! I have used it a little over a year now and its the one thing i keep re-purchasing whenever i run out. I also think this would work for many different skin types, My skin-type is sensitive-dry-combo and this works like nothing i've ever used before! Pimples and blackheads are reduced or vanished within 2-4 days and this also works well for redness, rashes, mosqito bites and swelling. I literally never travel without it! After using this my skin is always very smooth even toned and porcelain like and saves me from occasional rosacea flare-ups! This is one of the very few things my skin can tolerate, my skin reacts badly to topical vitamin C, A, retinol seaweed and others that's why I love the formulation of this gel: the aloe vera is an amazing skin healer and the menthol & witch hazel is good for troubled skin! I wish @Bliv would create more products with this formula, a face wash or a sheet mask maybe? Please consider it this is truly a 5 star product! Ps: Just a little expensive tho, but totally worth it! The gel is light and easily absorbed by the skin. I like that it does not leave a sticky feeling or residue. It does not really remove blackheads but I find that it helps in oil control and reduction of the size of pores. 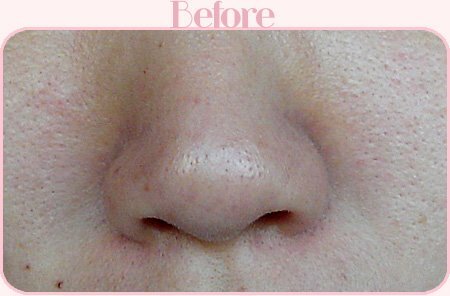 There's a significant improvement in my problem areas (nose + chin) - the pores and blackheads do not look so obvious and unsightly. I was also apprehensive that the product would be drying for my sensitive skin but it was surprisingly not. My nose feels so smooth and matte, with no signs of peeling at all. I had ordered a small sample online for trial purposes and was so convinced I bought a retail size within a week! (Helped that there was also an ongoing store promotion at that point in time) I've tried other products for blackheads, pore reduction and oil control but I must say this is one of the most effective I've ever used. i've been using this for a month now, and i've had problems with blackheads for years now. this got rid of my problem, but unfortunately i didn't take the advice of the sales person and buy shrink + tighten, and because of that my pores are enlarged. no worries though, nothing some shrink + tighten won't cure! I used to be (and still am) troubled by black and white head problems but using only a few time of Off With Those Heads, my nose and areas of cheek which i apply on, feels less oily dramatically! The blackheads on my nose did not disappear upon using, i would suggest users to clear out their blackheads first before starting this "treatment", making your pores clean before using will make the product more effective! Mainly it controls the sebum level thus slowing the development of blackheads. So it does not actually makes blackhead disappear. It's fabulous! It clears the blackheads and whiteheads on my nose! no more squeezing of blackheads! I squeezed a sample from the testing kit into my small contact lens holder and used it when i got home and am addicted to it...I've been searching high n low at a few gurdian stores and I cant find it. It's always sold out. I have more whiteheads than black..After applying, I use the metal extractor and without much pressure, the heads are SO easily pushed out..I was so amazed and continued to use it. 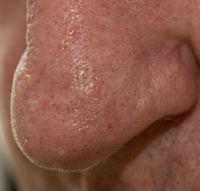 My nose pores are more refined and I have lesser heads after a week of use. I used to use biore pore pack but the heads kept returning. With off those heads,it like dissolves those stubbron hard heads into mush.. it helped to shrink those pores too..Im gonna get the bottle asap..=z my wedding's coming up in 3 months and im doing my own facials - im so glad I found off those heads! My stubborn forehead and temples always get clogged and w this...it's now SO much smoother..i cant wait to get my hands on a bottle.. pricey but u'll pay cuz u know it works!! happy me.. I bought this last month I think, in one of Sasa outlets in Ipoh. Actually I don't really had problem with blackheads. On the other hand, whiteheads are my arch nemesis. Like totally. I'm getting married in less than 3 months, so I needed to get my whiteheads under control. I was a bit skeptical about Off with Those Heads at first, but after reading few rave reviews I gave the product a chance to prove itself. then WALLA~! After day-3 I noticed the result already! MAybe it didn't removed ALL the whiteheads on my nose and chin, but it definitely improved my pores size, my nose was looking smoother with lesser whiteheads popping out now and then. So I continued using it, and usually after pairing it with another b.liv product, it does wonder to my whiteheads prone areas. My whiteheads now (after using it after 3-weeks) were under control, it's there, but after exfoliating/scrubbing they were gone. Off with those Head can easily rated as a 5-star product if not for its price. T_T At RM 139 per 30 ml bottle, it is definitely expensive to be honest. Luckily I didn't have to apply a lot of the product on my skin! Approximately just a pump per day will do. It will last long, but if b.liv could lower the price for a little bit, I wouldn't mind to be a loyal fan. FOREVER! Who doesn't have whiteheads and blackheads these days? Unless of course, if you go to facials every other day and get them removed... but again how many average people has that much money these days to spend on facials every other day? Where pore strips may help, they're pretty painful on the nose... and you can't really used them to remove those 'invisible' whiteheads on your chin! 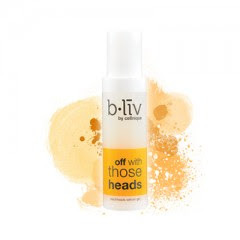 Well, thankfully, bliv came to my rescue with this wonder product, Off With Those Heads! Reading the good reviews across the net, I snagged myself a couple of samples and tried them out. While it didn't work for me in the miraculous 14 days as advertised, I kept on using them even as I grew wary of this product... thus one month to application... Voila! My blackheads are definitely reduced to almost nothingness and my whiteheads... well, they're not gone, but they're right now another history in the making right beside those annoying blackheads! No more whiteheads are forming, as far as I can tell, and I haven't spotted any new blackhead since I used this product (I bought myself full sized product in case you're wondering)! On the side note, I read on some internet review that using pore strip to remove whiteheads that're already formed on your skin will definitely help speed up the good-bye-whiteheads-and-blackheads-hello-clean-skin journey. i have started using off with your heads since it was first known as cellunique. i have had tons of blackheads and stubborn ones too, but no product has ever been able to get rid of them except b.liv. it is light and very refreshing because of the menthol. i will continue to use it and even my boyfriend started using it :) shows how good it really is. I have been using b.livs most reputable blackheads sebum gel for approximately one month and it has proven its worth by eliminating those nasty blackheads/white heads within 2 weeks. To this day (month later) there has been no appearance of black heads/white heads as of yet, so even though this is one costly product, it does its job within the amount of time described. Buy it and save time + extra money buying non-effective products! !